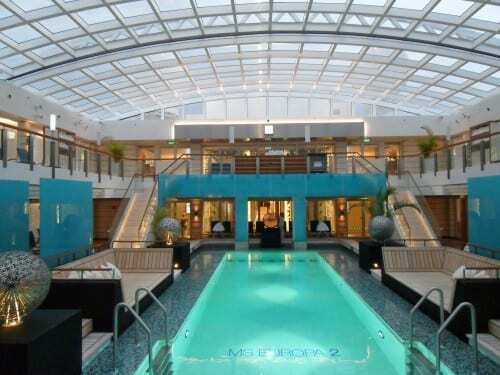 My friend Kay Showker recently visited Hapag-Lloyd Cruises’ ultra-luxury ship Europa 2. Kay is a New York- based author of The Smart Traveler and author of 15 travel guides. Here is her report. “We are proud of our extravagant space,” noted Karl Pojer, CEO of Hapag-Lloyd Cruises who was in New York last week with the Europa 2 on her first visit to New York. At an 85.0 space-to-passenger ratio — the highest of any cruise ship – it’s not an idle boast. “In designing the ship, we equated space with luxury and elegance and believed that would appeal to the clients we want to attract,” Pojer told me. Yes, Europa 2 is extravagantly spacious and with her understated décor where less is more, she is the very definition of luxury and elegance. 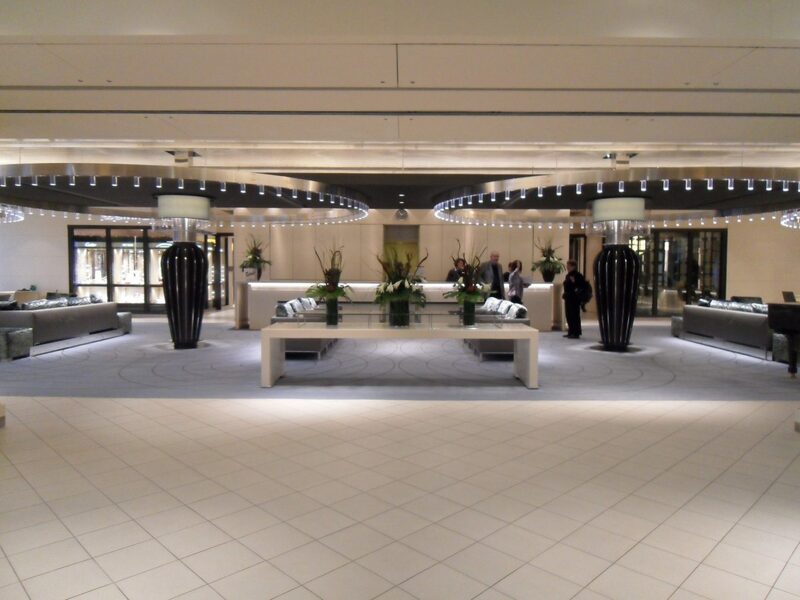 Overhead in the spacious lobby are silvered circles of light. The glass sculpture, one of 890 works of art, most by leading German artists, commissioned for the ship. Europa 2’s owners, Hapag-Lloyd Cruises, a 1970 merger of two lines that date back to the 19th century, operates four other cruise ships — Europa, Bremen, Columbus, and Hanseatic — geared mainly to the German and German-speaking European market. From the launch of the 42,830-ton, 516 passenger Europa 2 in May 2013, the company has aimed to appeal to a broader international market, particularly from North America, the U.K. and other English-speaking countries. The goal, according to Pojer, is for international travelers to make up 15% of the mix (not 25% as was widely reported earlier). 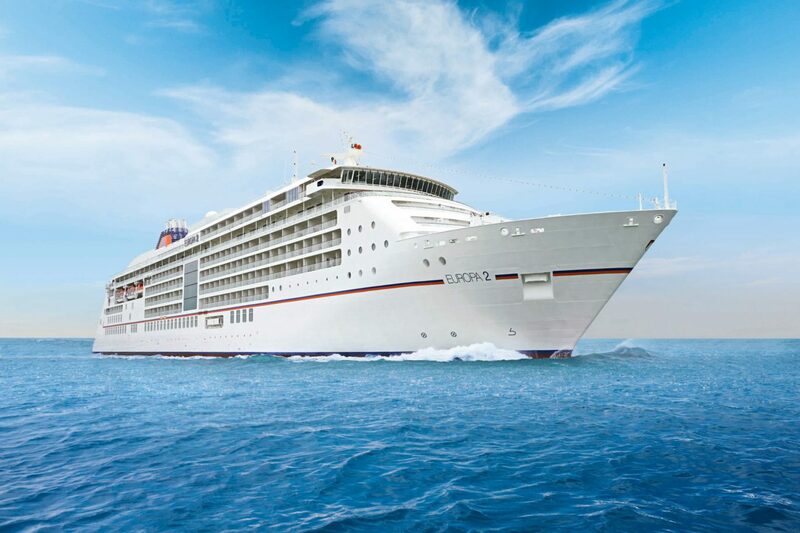 As part of the effort, all of Europa 2’s officers, staff and crew are bilingual in German and English on all her cruises and shore excursions have English-speaking guides. There has also been an effort to create a more contemporary, family-friendly, less formal atmosphere by eliminating some of cruising’s tradition such as the captain’s table and structured dining times. Europa 2 has many features likely to appeal to international travelers: All accommodations are suites and all have balconies. There are seven restaurants and six bars, a large spa and fitness area, a mega swimming pool with a retractable roof and adjustable temperature, a golf area and pro, interesting enrichment programs, a cooking school, and worldwide itineraries that follow the sun. Throughout the ship, the suites and public rooms are adorned with the 890 works of art — mostly contemporary and most by leading German artists — that were commissioned specifically for the ship. Ocean Suites bathrooms have a window onto the bedroom giving it daylight. Without doubt, the ship’s top asset is its 251 ultra-modern, spacious suites. Situated on decks 5 through 10 with the top ones on deck 10, they come in eight categories and range in size from the 141 Veranda Suites with 375 sq. ft., including balcony, to two 900 square-foot Grand Penthouse and two 1,066 Owner suites with enormous balconies. 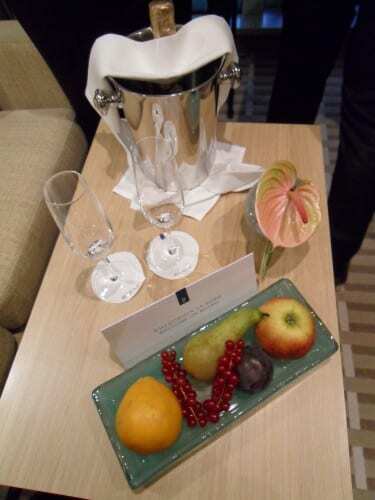 No matter which type of suite you choose, fruit and champagne (top suites get Dom Perignon) awaits you on arrival. The suite will have an ocean view veranda; a sleeping area separated from the living area; high-quality contemporary furnishings; 24-hour suite service; hair dryers, safe, flat-screen television, Wi-Fi (for a charge), tablet PC (similar to iPad), portable telephones, minibar with free water, soft drinks and beer (the mini-bar in upper category suites is stocked with six bottles of spirits, gratis); a Nespresso machine with five kinds of espresso from decaf to the strongest coffee. The categories above Veranda Suites have butler service. All suites have generous storage space, usually with a walk-in closet and multiple drawers. Their teak covered balconies are furnished with a cushioned lounge, cocktail table and two chairs. The Veranda Suites, which are the majority accommodations, are basically large junior suites dressed in blond wood and muted colors with the sleeping area divided from the living area by a frame of wooden slates. The bedroom is furnished with a queen bed and a dressing table with a three-way mirror. There are bedside tables and controls for the lights. The living room area has a sofa and large flat-screen television and its cabinets are stocked with deluxe crystal and cutlery. The bathroom, faced with marble, has double sinks, a separate tub and glass-enclosed rain shower and a sitting ledge. Toiletries are Hapag-Lloyd’s own brand. Electrical outlets are 220-volt and have European plugs; adapters and converters are needed for 110-volt appliances. The mini-fridge’s complimentary stock is replenished daily during the twice daily turndown service. Fruit and champagne awaits you on arrival. Similar to the Veranda Suites in size, furnishing, and amenities are the 59 Ocean Suites. Since all suites are oceanfront, the name of this group is confusing until you learn that their bathrooms have windows onto the bedroom (yes, they have privacy screening) providing daylight in the bathroom. The 24 Grand Suites with 560 sq. ft. provide a wider layout with a full living room with an L-shaped sofa and flooded with light from floor-to-ceiling sliding balcony doors. A wooden-slate screen separates the sleeping area. The balcony is longer than those of the standard suites with room for two chaise lounges, two chairs and a table. The bathroom has two sinks and a television, a bathtub and separate shower. The Grand Suite is also available with facilities suitable for the disabled. The 16 Spa suites – among the most desirable – are same size and layout as the Grand Suites and with similar amenities, but their décor uses warmer colors and bathrooms with windows into the suites provide natural light. These suites have whirlpool tubs and rain showers with steam sauna. The ship’s most expansive and expensive accommodations are the two 900 square feet Grand Penthouse Suites and two 1,066 sq. ft. Owner Suite. Each has separate living, sleeping and dining areas and guest bathroom. The main bathroom with sea views and a whirlpool has twin sinks, a shower with steam sauna, daybed and television. In addition to the complementary mini bar is stocked with top-quality spirits, occupants benefit from some exclusive services. 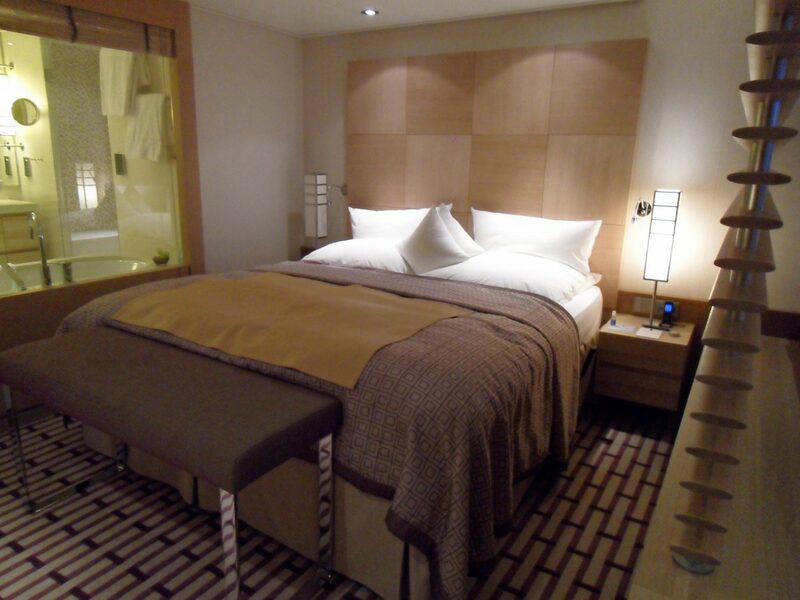 New to Hapag-Lloyd on Europa 2 is a group of seven suites which the line calls “family apartments.” They combine two identical cabins, each 215 sq. ft., with separate bathrooms and are connected by a door and two 75 sq.ft. balconies, enabling parents and children to live in separate sections, if desired. The mini bar is stocked with free soft drinks and beer. 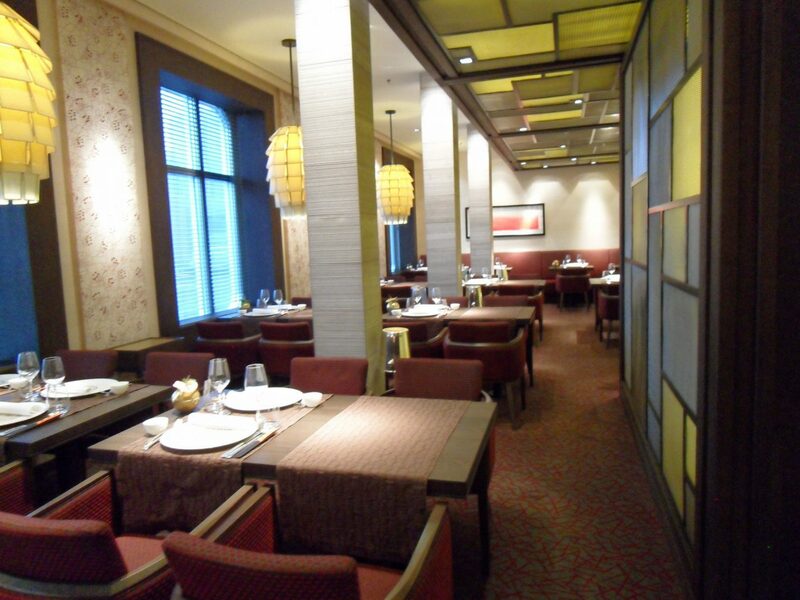 Europa 2’s restaurants offer an enticing variety. 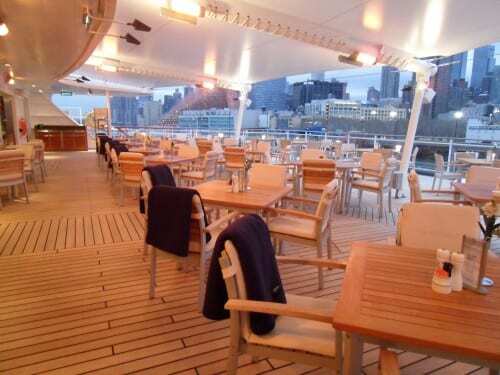 Weitmeere, on deck 4, the main and largest restaurant, features international cuisine and regional specialties, and serves an open seating breakfast and lunch, buffet style, and traditional seating at dinner. Also on deck 4 are Tarragon, the French specialty restaurant; Serenissima with Italian fare enjoyed under fancy Murano chandeliers; and Elements offering a range of Asian cuisines. The china, crystal and sterling silver cutlery were designed specifically for each restaurant and made by leading German companies. The wine list is extensive. Restaurants charge for soft drinks, bottled water, and beer, which seems strange since these beverages were available in one’s suite without charge. Deck 4 also has the Grand Reserve, a private dining room for wine tasting with cuisine to complement the wine. It carries a serious surcharge. The Yacht Club on deck 9 is the popular, casual buffet restaurant with indoor and alfresco seating. The very attractive venue serves three meals daily; in addition to the buffet, one can order from a menu. The pastas are made fresh daily, the fish is fresh from the sea, and the meats are grilled to order as you watch. We were told that the captain eats there frequently, which speaks to the food and the venue’s ambience. Sakura, the sushi bar, is tucked away on one side of the restaurant, as is the children’s dining area. Gourmets and would-be-ones can hone their skills at Europa 2’s Cooking School under the guidance of the chef from the Tarragon restaurant. Classes are held in the kitchen equipped with high-quality Miele appliances and vary according to the skill level being taught. Cost is about 80 euros. Europa 2’s bars come in variety, too. The Sansibar on deck 8, offer snacks and beverages with sea views to enjoy in the afternoon and music and dancing in the evening when the DJ livens things up. Styled after Germany’s famous beach bar on the island of Sylt and exclusive to Europa 2 and Europa, the lively place is probably the most popular venue on the ship. The Pool Bar on the sun deck offers fresh juices, snacks for breakfast and lunch, and coffee and waffles during the day. Herrenzimmer, a smoking room with a full service bar and comfortable armchairs, has a humidor for Cuban cigars and a selection of fine brandies and liqueurs to enjoy with them. (Smoking is meant to be limited to this smoker and suite balconies and is not allowed in restaurants and public rooms, but we are told Europeans don’t always obey the rules and will be found smoking, particularly in some of the bars. The Jazz Club on deck 4, with a stage for a band and bright red neon lights overhead is quite a departure in the ship’s décor but fitting for its casual atmosphere. The infectious sounds range from cool jazz to easy listening and to enjoy after dinner and to dance until the wee hours. Down the corridor on the port side is the Wine Bar. The Theatre or main show lounge offers nightly entertainment. 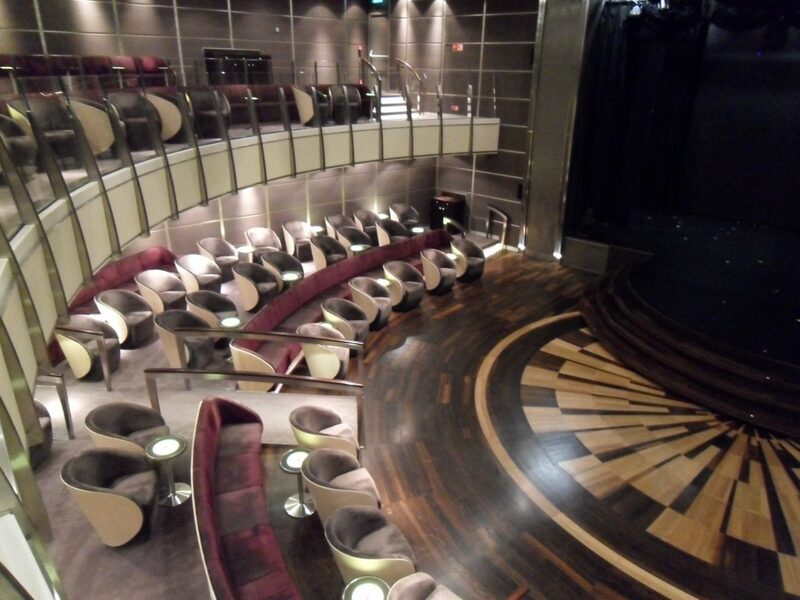 In addition to the lobby and reception, tour desk, restaurants and bars on deck 4, the Theatre or main show lounge occupies the forward area. Nightly entertainment includes production shows, singers, dancers, acrobats and contortionists. The theatre is also the venue for lectures and the captain’s cocktail party. The Belvedere Lounge, forward on deck 9, is the venue for afternoon tea, to be enjoyed with musical entertainment and views of the sea. It’s not traditional British-style tea; rather, passengers make their selections from a case one might see in a pastry shop. Deck 9, also has the ship’s library with books, CDs and DVDs, mostly in German; a card room, and four computers for passengers use. Next door is a small 3D cinema, used for port talks, film screenings, and lectures; and nearby, an art gallery with changing exhibit of contemporary and traditional art supplied by German-based galleries; some works are available for sale. The ship does not have a casino which could be a flaw for some potential American and British cruisers. 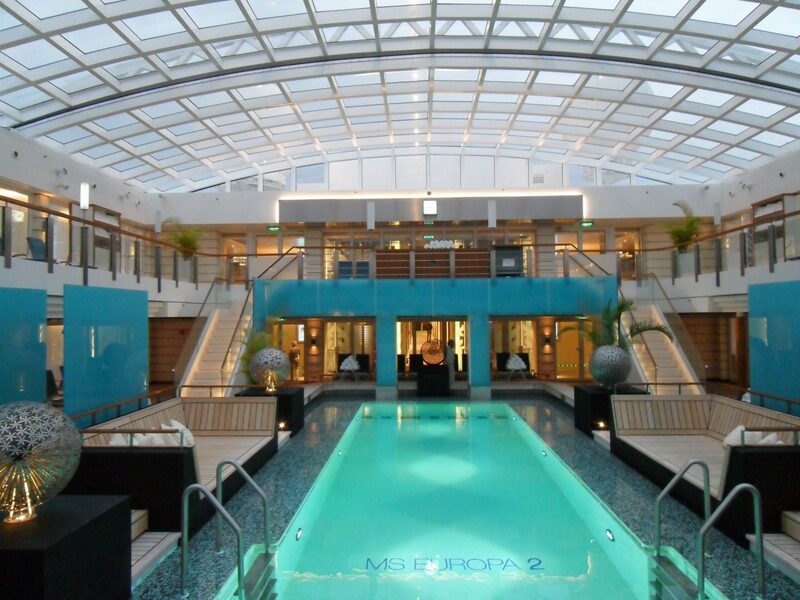 Europa 2’s Ocean Spa is the highlight for many passengers with special appeal to younger, more active ones. In addition to eight treatment rooms with a range of beauty and therapy offerings, the 10, 800 sq. ft. area has a well-equipped fitness room and offers classes for Pilates, yoga, Zumba, indoor cycling, body circuit, water gymnastics and body sculpting. There’s a full-service beauty salon, four saunas, a hammam, an indoor whirlpool and an inviting relaxation area aft. Your Personal Spa, a new attraction for Hapag Lloyd. It has a separate whirlpool, massage tables (with televisions set in the floor to watch while you’re face-down) and a relaxation area. The private space is available on an hourly or daily basis for a charge. Little known, too, is the clothing-optional area, apparently popular with German passengers. The mega swimming pool has a stunning, inviting setting; the magrodome roof overhead is closed during inclement weather. The mega swimming pool — very large by cruise ship standards and long enough to actually swim — has the most stunning, inviting setting of any cruise ship pool this reporter has ever seen. Flanked by teak wood decks and benches and enlivened with sculpture and garden greenery, comfortable blue lounges line the aisles and the balcony overlooking the pool. Overhead is the magrodome roof, closed during inclement weather. At one end are the cozy nooks with wide loungers facing out to the sea. At the 700 sq.ft. golf area, classes (included in fare) are available, as are personal trainers but for an extra fee ( about 45 euros for 30 minutes). The ship has ample open deck space for walking or jogging; bicycles for passenger use free of charge are available when the ship is in port. Families are a prime market for Europe 2 and the line offers several features to attract them. Children up to and including 11 years of age travel free of charge in the suite of their parents or other full-paying accompanying persons; those between the ages of 12 to 15 years pay €50 per night. The Yacht Club has a children’s dining area; and the swimming pool is reserved for children from 10:00 to 11:00 a.m. and 4:00 to 5 p.m. The Kids Club for ages four to ten is only one of many facilities for children. In addition to the seven family apartments, age-specific activities and services with games, sports and creative programs are available on board and ashore. The Knopf Club is for children age two and three (care here is subject to charge and the number of participants is limited); the Kids Club is for ages four to ten; and the Teen Club for teens 11 to 15. Shore excursions have special prices for kids 11 and under; day trips ashore can be arranged for families. Trained nannies are on board; upon request on sea days, a late-riser service (for parents at a charge) collects children from their suites and looks after them from 8.00 a.m. onwards. The ship offers family cruises from time to time. These attractions seem to be working because as many as 60 children were on a recent cruise. Europa’s itineraries follow the sun and her size enables her to call at many off-beat ports where large ships cannot go. The ship also stays overnight in many of its ports enabling passengers to experience more of the destination’s culture and nightlife. During the 2016-2017 season, the ship will make its first visit to Cuba as well as to the islands and countries of Oceania. To date, Pojer reported, the ship is running at a 98% occupancy. Perhaps most surprising, 50% of their clients have been first-time cruisers and another 50% were on their first Hapag-Lloyd cruise.